Board 2 is underway. I'm a bit more excited about this one than the first one because there are a lot fewer unknowns in getting this one underway. Also, the outline, rocker concave and flex profile have all been designed using the Excel workbook I pulled together so its a plagiarism free board too!!!! I got a bit ahead of myself with the last post and forgot to record the cores and rails before actually starting to glue things up. So for posterity here's some snaps of the pieces so far. This is the bottom piece of the core - 6mm Klegecell. The paper template was printed from the design workbook which I've christened 'Board-Off Kiteboard Designer'. Its printed on A4 sheets and then tapped together. Once the designed stabilise a bit more I'll commit them to wood templates but while the experimenting is continuing paper works fine. Unlike the last board which had a step profile on the core this board is going to have tapered tips. The modelling suggests that this will mean that the tips will flex about 20 less because the mean thickness of the tips is greater. To help minimise this I've cut a couple of recesses in the top layer to reduce the average thickness and also to give the area where the fin reinforcement goes a flat place for the screws to connect to. The picture also shows my new 2011 Crazyfly footpads. Awesome pads ( its all about the toe holds) but also work out to be the same price as all the rest of the materials for the board. Working out how to make these is high on the priorities for keep the overall board coast down. 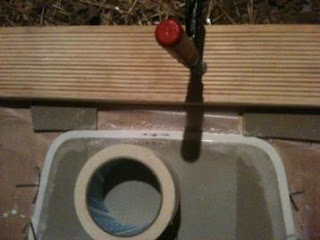 I used a plank of wood wrapped in sand paper to put the tapper on the top layer. I did this before the top and bottom where glued together. I placed a piece of 4mm ply over the top of the sheet and moved it around until I length of wood I was using as a sanding block was on the angle of the tapper that I needed. Then just spent 20 mins slowly sanding it with 60 grit sand paper. I thought this would be too rough but any finer paper and it just wasn't removing the foam quickly enough. 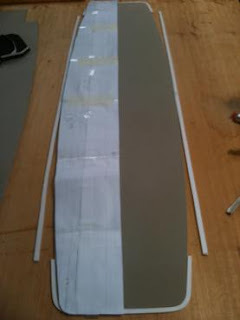 Also, I'm going to lay a 1.5mm balsa wood veneer over the top so in order to keep the maximum core thickness down to 12mm I need to plan about 1.5mm off the thickness of the foam. It was way too big a job to do by hand and so I resorted to an orbital sander with 60 grit paper again and planned off the needed amount from the lower core piece. This also made the lower core piece the same height as rail material and so removed one step that would need to be either sanded off of filled with q-cell. 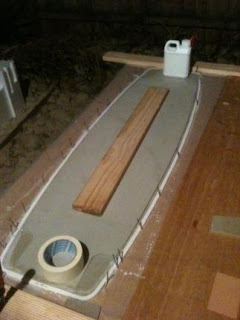 Here's the rails being glued in place. Used the same technique as last time but used thicker mixture of q-cell and resin. I think that next time using 5 min epoxy and doing one bit at a time is the way to go. This step is unnecessarily long and because it is vertical faces being glued and the faces don't match perfectly, the epoxy does run away and pools underneath. I started with the tip pieces first and clamped them between 2 pieces of wood. I used offcuts of klegecell to put end pressure on both end rail pieces to make sure they fitted snugly to the end of the board.